Black Kite Cellars produces small lots of expressive Pinot Noir with a strong sense of place. Whether from Black Kite’s own Kite’s Rest Vineyard in Anderson Valley, the Soberanes Vineyard in Santa Lucia Highlands, or Glass House Vineyard in Santa Lucia Highlands, each Black Kite Pinot Noir is treated to near-identical winemaking by winemaker Jeff Gaffner. Black Kite Cellars produces less than 3,000 cases annually of Pinot Noir and Chardonnay. The wines are sold primarily through the winery mailing list at www.blackkitecellars.com, with limited distribution to select wine retailers and restaurants. 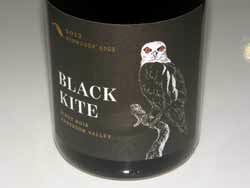 The Black Kite Cellars Pinot Noirs never disappoint and will appeal to those who like plenty of concentrated ripe fruit flavor with generous oak backing. The 2012 wines reviewed here are among the best ever produced at this winery. The “Stony Terrace” and Soberanes Vineyard bottlings will be reviewed later.